The race started a bit later this year, which was fine by me. It meant a chance to sleep in! And, because I've run this race before, I knew what to expect with getting there and finding parking, etc. I had my race packet already, and I didn't need to get to the venue as early as I would have in the past. 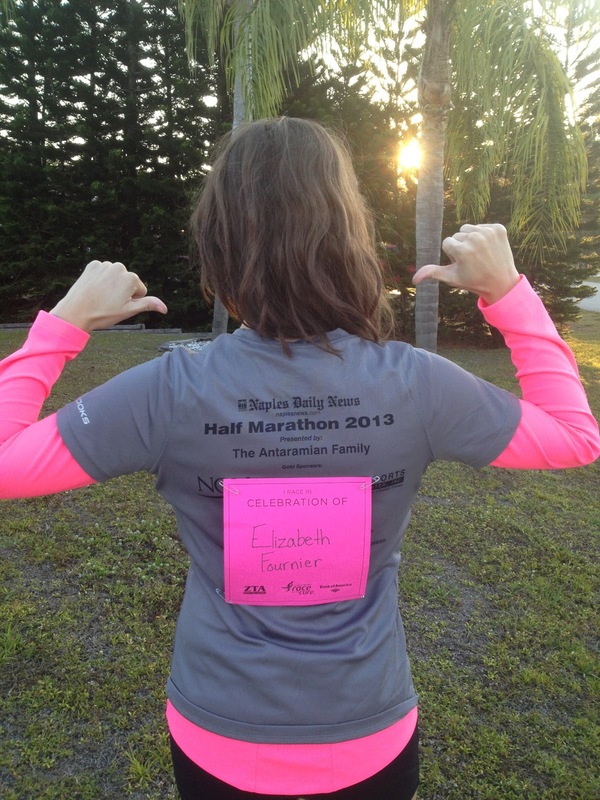 This year, I remembered to run in memory of M's grandma, who passed away from breast cancer when M was in 8th grade. 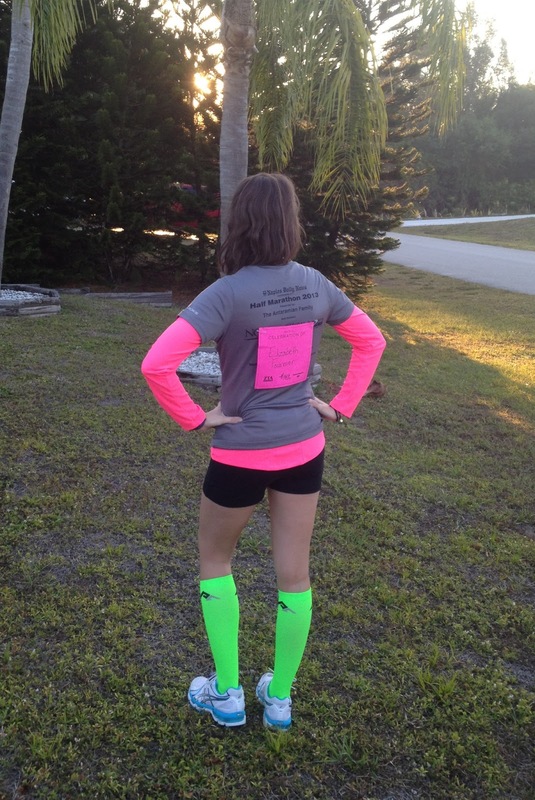 I loved my bright neon for the race, but it was WAY too early/bright for a look at my face. I don't know if wearing her name is what did it, but I was really emotional at the opening ceremonies this year. My students tend to do the fun-run/walk for this race, and sure enough I passed a group of them on my way to the start line. It's always nice to see them involved in a good cause, up early on the weekends, and participating in an event like this. After chatting with the students, I went and did a warmup lap, about a quarter mile at a nice slow pace, and then did my stretches. It was cold in the morning, but by the time the race began at 8:15, it was in the mid-60s and sunny. I was a little warm at certain times in the race; I really need to remember that I heat up really quickly, no matter how cold a run starts. Anyway, I took it easy (or so I thought) in the first kilometer or so, then began to boost up my speed. I didn't worry about keeping pace with anyone or avoiding being passed; I just was true to myself. Being so familiar with the course was very helpful. I knew exactly where I usually tired out and was able to power through; I knew the upcoming turns and when we were nearing the end. Because there were no surprises, I was able to crank up my speed earlier than usual, and finished with a PR! This is bittersweet, though. I really sprinted the end because I saw the clock was at 28:50, and my goal for 2013 is to break 29 in a 5k. But by the time I crossed, the clock read 29:07; my official adjusted time was 29:04. So I missed my goal by 5 seconds! At first this was discouraging, because if I had just kept my pace up in mile 2 I would have gotten it. But as a runner-friend pointed out later, being that close to my goal shows that I have some pretty crazy self-awareness going on, and I'm on target to meet the goal this year. My stats ended up as: Adjusted time: 29:04; Adjusted place: 279/576 overall; Age group: 13/36; Female overall: 110/326. I had a baby shower to go to post-race, so I didn't hang out long. BG has been a best friend since middle school, a bridesmaid of mine, and a runner. She's going to eventually write a guest post here about her half marathon in Africa, but obviously she has things on her mind right now other than writing. My sister and mom were at the baby shower, as well as other friends from the good ol' days. It was nice to reconnect, especially as I discovered one such friend lives in my neck of the woods! Small world! I'm looking forward to seeing more of her. She had been invited to "this running club on Tuesdays" but doesn't run; turns out it's the same group M and I go to (6 weeks to 6 miles), and I urged her to come along, so I hope to see her this week. We three clean up pretty nicely. 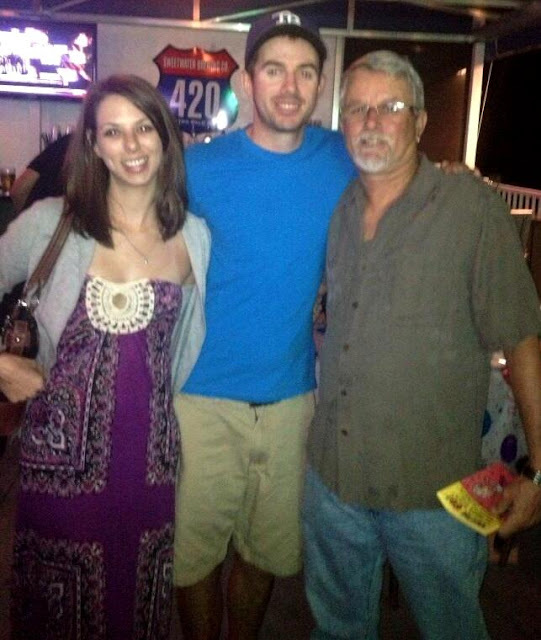 Me, BG, and AP, who will hopefully make an appearance at the running group this week! That evening, we went to dinner for M's dad's 60th birthday. It's not a party-worthy picture if it's not dark and blurry! What a packed and excellent weekend this was! I'm enjoying being busy, but I'm woefully behind on school work. Is it spring break yet? I stopped reading when I realized you were running in 60 degree weather. SO jealous!!! Sigh. I need to move. I can't complain, that's for sure. March has been beautiful this year!